Is opera in cinemas the perfect introduction to the art form? Cinema attendances now outstrip those of the theatre, but is the cultural phenomenon of live relays a valid artistic experience in its own right? The future of opera, and the role of technology within it, is a question that for some time has been at the forefront of my mind, both as a PhD researcher and an opera lover. Presently, a whole generation of potential opera fans are coming of age in a time where world-class productions are relayed live to thousands of cinema screens across continental divides. The potential of live cinema broadcasts of opera and ballet – which bring the art forms to life via 21st-century technology from companies including the Royal Opera House and the Metropolitan Opera – is awesome. In the space of just a few years, the Royal Opera House’s annual ‘virtual audience’ already outstrips its auditorium attendance. However, opera cinema audiences in particular are mostly made up of seasoned veterans, the kinds of folk who know their Traviatas from their Toscas. The question remains: can ‘opera cinema’ have any special appeal for new audiences? Why, you might ask, would anyone with a budding interest in opera pass up the opportunity to watch their first production on the stage? What does the popcorn-munching mundanity of the multiplex have to offer over the presence of live performers working their magic under the proscenium arch? That is what I set out to discover last year. As part of a preliminary experiment for my ongoing PhD project, I invited 20 members of the public (of mixed ages, genders and backgrounds) to lose their operatic virginities – for science. My subjects watched John Fulljames’s Royal Opera production of Rise and Fall of the City of Mahagonny in the Covent Garden auditorium and a cinema of their choosing. I then had them compare their experiences, specifying what they liked and disliked about both settings. There are two reasons that my research focuses on opera virgins. Firstly, the whole discourse around opera in cinemas is based on (usually negative) comparison with the stage. Opera-savvy audiences naturally compare what they see with what they already know. The result is that we don’t give much thought to the value of opera cinema as a cultural experience in its own right. A pity, as there are many things that opera cinema can do that staged opera cannot. For instance, the visual language of cinema provides an unparalleled level of intimacy and detail. For the same ticket price, every member of the opera cinema audience enjoys privileged access to the stage action. Secondly, I wanted to ascertain whether certain aspects of opera cinema (such as the perception of greater ‘accessibility’, familiarity and comfort) would resonate with my opera virgins, perhaps fostering increased enthusiasm for attending a staged production. Ultimately my subjects divided themselves into three discrete groups. The first (whom I dubbed ‘new purists’) fell immediately head-over-heels in love with opera, but insisted that it belonged on the stage. As one respondent put it: ‘until you’ve seen an opera in an opera house, you haven’t seen an opera’. The second group was made up of people for whom opera was both aesthetically and culturally intimidating: old-fashioned, ‘stuffy’ and esoteric – in short, not for them. Finally, a significant minority of ‘opera cinephiles’ seemed genuinely to prefer opera in the cinema. This was partly for the reasons I anticipated (increased comfort, enhanced legibility of the drama and so on). What I hadn’t banked on was a certain sense of ‘philanthropic’ value, wherein subjects praised the Royal Opera House for making its productions more readily available. I’m currently in the process of expanding my research outside of London, introducing Hereford and Hertfordshire audiences to the operatic world via live-streaming. My initial findings suggest that opera cinema at the very least has the potential to introduce successfully newcomers to the form, in addition to engaging existing opera audiences on its own merits. We’re not there yet, but given the right nudge it is not inconceivable that the silver screen might become the popular point of entry for the opera-curious. The Royal Opera House and King’s College London are partnering to research opera in cinemas. Find out more about the Royal Opera House’s Live Cinema Season. What do you think of opera in cinema? Let us know in the comments below. Living in South Africa being able to see e.g. The Metropolitan 's Live in HD in cinema is absolutely priceless. Would be fantastic if the Royal Opera's films were also shown here. We screen in Cape Town at the moment and would love to be able to screen elsewhere. If you would like to email the name of your local cinema to cinema@roh.org.uk then I'll ask our international distributors to look into the possibility of screening there. I was really interested to read your article, and I think the subject is fascinating, particularly from an aesthetic performance point of view. Personally, I am really pleased that opera is available in cinemas, mainly as an accessibility issue. I did my degree in music and trained as a classical singer. I have since moved to Hampshire and have a young family, so there is little opportunity for me to see opera here, unless I travel to London, which is expensive and impractical. I have always felt that opera needed to be more accessible, as it has so much to offer as an art form. Also, showing it in a cinema also makes it more affordable, and possibly opens it up to a demographic of people who wouldn't otherwise be able to afford to see it. I think by treating opera as exclusive, precious and high-brow, only to be shown in the opera houses, some how suggests that it wouldn't hold it's own in comparison to other art forms, which does opera a huge disservice. Very glad you enjoyed the article, Stephanie. I absolutely agree with your assessments. The way I'm parsing it right now is that opera cinema offers 'accessibility' in both the material (e.g. price and convenience) and 'aesthetic' sense (the double-direction affording more clarity to the narrative). I'm finding through my research that quite a few people still don't know that live cinema is an option! Of course it's not only about broadening the operatic audience. The real change will come when opera cinema is accepted as a unique experience in its own right. I think this is already starting to happen for live cinema more generally, so it's only a matter of time. Exciting stuff! because we live in Ploermel in Central Brittany theatre productions are something of a rarity. We are not that keen on driving into cities so to be able to go to our local theatre and see either an opera or a ballet in real time is priceless. We have done this twice now with this years current programme and fully intend to continue with the new one. It is a very special thing to do - just wish that the audience would sort of enter into the spirit of the thing and clap - I clapped the curtain calls but was very much in the minority!!!! However loved every minute of the performances and can't wait to see what is on the next years programme! I've found quite a bit of variability: some audiences clap uniformly, others you get patchy clapping. Generally speaking I find the 'arty', independent cinemas are more unified in their applause when it comes to the curtain call. That being said the last Odeon I visited gave us all a free Magnum ice cream. Glad you've been enjoying the shows! A fascinating research topic - cinema relays also bring back the world of opera back to those of us who used to attend ROH or ENO but now have mobility issues. However wonderful it is to be able to participate in live relays, I do wish I could control some of my fellows - popcorn and crisps do not enhance the experience. At my local cinema the audience is invariably 60+ and knowledgeable- how can we open it up? "At my local cinema the audience is invariably 60+ and knowledgeable- how can we open it up?" Do we need to? IMO it depends on whether people are continuing to develop an interest in opera as they get older. People mature as they age. However, if the current 60+ audience is not being replaced, we do indeed have a problem. Yes, the point about mobility issues was something that came up in one of my focus groups with a respondent who works as a nurse. It's one of the most positive aspects of these events that long-term operaphiles can keep seeing the shows they love! When it comes to opening up, I suppose that's the 64,000 dollar question. I suspect the answer lies in a combination of things: in the short term ensuring these events are visible to younger, potential audiences (which is a question of marketing) and in the long term demystifying opera for the new generation so that it's a part of their lives growing up. We attend just about every MET in HD offering at our local theater. What would be do without it in our cultural wasteland in the southeast US? But the bad news is that although the performances are often sold out, the audience is almost all retirees. As a singer and as an audience member, I wouldn't want to be without the live theatre. But I also cherish the performances of Live in HD at the cinema. They not only take us backstage during intermission, but also make it far easier for my failing hearing to get all the pianissimo passages that would otherwise exist for me only in memory. Purists need remember that for millions of people, it's not a question of either live or cinema, but of seeing it on screen or not seeing it at all. That last point is, I think, very pertinent. Although to be fair I reckon that more and more opera lovers are recognising staged and screened opera as complementary rather than opposed. Re: the advantage of opera cinema to people with impaired hearing, I think this is an important, sonic dimension of 'aesthetic accessibility', of everyone in the cinema getting privileged access to the art. Thanks for sharing! I teach a course on opera for first-year college students, the majority of whom are opera newbies, and we attend both a live performance at our local opera company an an HD broadcast from the Met. I prepare my students by reading about and discussing the two types of experiences beforehand. To a certain extent, their reactions depend on the particular operas being performed (which I really can't help, given the limited dates available during our semester), but I've found that the live theater performance makes a better impression on them. There is still something about "going to the opera" versus "going to the cinema" that seems to resonate with young people, at least in my experience. Good work on doing the homework with them in advance: I imagine that helps a great deal. On balance I've found that for people of all ages the auditorium experience tends to make the most powerful first impression. The cinema is no substitute for that. Of course, this is the point! My hunch is that live streaming (being cheaper, more convenient and perhaps more visually legible) has advantages of its own that appeal on different levels to staged opera. I also suspect that it will become a more effective 'bridge' to the auditorium once it is appreciated as a distinct cultural experience in its own right, because it will (hopefully) accrue more attendees who are not already familiar with the form, thus exposing a more diverse cross-section of the population to opera. Oh yes, the live relay system to cinemas is invaluable. I cannot be alone in not being able to travel to major opera houses these days and it is a wonderful experience to be able to watch performances close to home as they play out on the stage. Obviously the experience is inferior to actually being there, but it is a seriously good runner-up. Not only the ROH, of course. I will be watching Elina Garanca from the Met next week. How could I ever hope to do so without live relay? I think it is both/and, as to stage and cinema. Being way out west in southern Oregon, and not having the kind of money to spend on travel, I don't have the opporunity to go to the big opera houses like so many in the NY or London area do. (Believe me, though, I am on a mission to see Mr Kaufmann live as soon as possible!) So, it is a gift beyond measure to be able to share in the experience of these works of art for those of us at a great distance or who don't have the means for expensive opera tickets or travel. And, there is the advantage of being able to focus more on facial expressions with the camera up close, which, unless you happen to have a great seat or phenomenal opera glasses, might be a difficulty live. That being said, the cinema experience has increased exponentially my desire to see live opera. As soon as possible! I know there is nothing like it...but I might not have known this desire without the live-in-cinema productions. It is definitely both/and for me. Could you link me to your blog? I'd be very interested to read it. I think it is the perfect introduction. Too many opera virgins I've met are intimidated at the prospect of attending the Met in its house either because of sticker shock at the price or the idea of dressing for the occasion (which isn't entirely necessary). Subtitles in the cinema are easy to read, the closeups demonstrate the singers' acting abilities, and other visual detail adds to the experience. This is the modern way to democratize the experience that many feel is for the Rich and Pretentious. The intermission extras are a lovely bonus. I'm currently working on a PhD at the University of York and would really value the opportunity to speak to you more about your work. Is there a way that we could be put in touch at all? I'd be delighted to speak with you. Feel free to drop me a line at joseph.attard@kcl.ac.uk. Joseph, thank you for your article. I found it incredibly interesting, but I feel that I would have been in a fourth discrete group if I had been part of your sample. Up until fifteen months ago, I was a very seasoned concert goer (my local orchestra is the wonderful CBSO and my local venue is the truly spectacular Symphony Hall). However, I had given opera a fairly wide berth because I just didn’t “get it”. What frustrated me was that I didn’t understand why I didn’t “get it”. By chance, in January 2015, I bought a ticket to the ROH Live Cinema screening of “Andrea Chenier” and, finally, I “got it”! The reason I hadn’t done so before was because I had never experienced the combination of this incredible music, the emotional pull and the visual spectacle of opera. I know that “Andrea Chenier” has its knockers, but what I heard and what I saw on that cinema screen completely changed my perception of opera: it broadened my horizons and opened up a whole new world of music, musicians and actors for me. 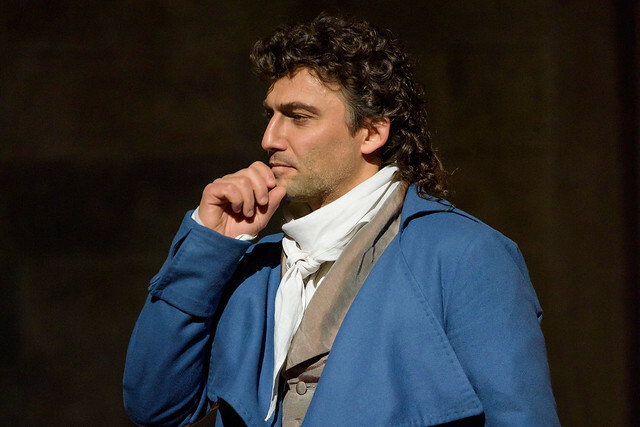 I cannot thank ROH Live Cinema enough for that: the thrilling “Andrea Chenier” was a life-changing experience. Unlike your sample, however, I am neither a “new purist” nor an “opera cinephile” – I’ll take it all! I fully appreciate that there is huge buzz from seeing live theatre and the thrill of experiencing artists such as Calleja, Kaufmann and Terfel “in the flesh” must be second to none (I haven’t yet been privileged enough to do so). However, I would not criticise the cinema experience or suggest that opera loses any of its authenticity from being on screen. I have watched and cried my way through all of the ROH and ENO live screenings since “Chenier”: I have thoroughly enjoyed them all and, as a newbie, have found the interviews and documentaries that accompany the productions invaluable. I have also been to live opera galas and have seen a number of touring productions that have visited my home city. I would never have experienced this had it not been for ROH Live Cinema and my local Odeon. I have not yet visited the Royal Opera House, but I very much want to do so, even though the cost of a top-price ticket is somewhat prohibitive. Please do not take this as a criticism of the ticket pricing structure: productions are hugely expensive to stage and, if you want to see the absolute best performers in the world, you have to pay for it. I want my first visit to Covent Garden to be the Sunday matinee performance of the mighty Mr Kaufmann in “Otello” next summer. I am saving my pennies and will fight tooth and nail to get my top-price ticket! In the meantime, I will continue to enjoy my many cinema visits and long live ROH Live Cinema. Thank you for that sharing your experiences so passionately and I'm so glad that opera cinema has opened the art form up to you. I suspect there are many other people for whom live streaming has the potential to demystify opera in this way. I'm certain there will be other respondents in my expanded sample who will put staged and screened opera on equal footing (frankly I think this is where I would place myself). Hoping to interrogate this a bit further before I write up! I was recently introduced to HD opera. We live in a rural area best described as a cultural wasteland. It is the retrace off for living at a beautiful beach. I am totally enthused by the HD opera I have seen. I have attended regional opera in other parts of the United States and enjoyed it. However, the level of the Met performances, the ability to see the preparation and the interviews with the performers are such a wonderful addition, I'm not sure I would go back to the opera house. Actually I'm would for different reasons, the atmosphere and the splendor of live opera is amazing. Additionally, my enthusiasm has spread to my friends. I have introduced friends who would never have considered going to an opera to join my husband and I at the local cinema. They loved it. I think there is room for both HD and opera house. As a long time opera buff who has little chance to see live opera, I appreciate and enjoy the Live at the Met. Certainly more than watching a DVD. One caveat: Given the chance, I would almost always choose a live performance over the Cinema, primarily because, with Cinema, I am seeing the camera director's interpretation of the Stage director's production. I would rather see the Stage director's version unfiltered by someone else. It's a good way of staying in touch with the big international houses, but I've had some bad technical experiences with the live Met performances, and you have to go to a cinema with a decent sound system. Prefence is for the delayed broadcasts, so all technical hitches are ironed out and you don't have to suffer the length of the "live" intervals. People are kidding themselves if they say it matches being in the theatre but it brings much needed cash to the companies then its great to continue with it. A good point on the sound set up at different cinemas. I'm actually split testing the next round of data collection across several cinemas to investigate this. I have been to live opera at the Coliseum, Covent Garden, Glyndebourne as well as the Met and Santa Fe but, living in the Peak District, trips to major cities, hotel stays and extremely high priced tickets now restrict the number of times that I can go to live opera. The cinemas are not full of people eating popcorn and crisps, a snobbish comment that can only originate in a small part of the opera loving public. Without the cinema to see fine opera performances, the future is dim and restricts to a rich few. Fortunately the Village of Tideswell has set up a small cinema close to us and we are able to join friends in watching opera from around the world. There is absolutely NO substitute for participating in a live performance - be it as a performer or as an audience member! The earlier this is begun, the more deeply engrained in the individual's psyche! Living in London means I never need to go to the cinema as I usually can find seats to fit my budget. The live event always is more enjoyable in most art and sport events I like however the cinema is brilliant for those who find London inaccessible or too costly. It's great that the Royal Opera has this series. Just a pity there's not more on TV to reach an even wider audience but it's not an alternative to the real thing IMO. Absolutely. More accessible (literally), more affordable and for those of us who don't live within geographical reach, just all round more achievable. Living miles away from London and being of relatively slender means, it's brought opera back into my life. Yes it's not the same as being in the theatre, much like watching football etc on TV isn't the same as being in the stadium, but surely it's a lot better than not seeing it at all? I will probably never visit the Met in my life, however much I'd love to. It has been a massive delight to experience it just a little from the seat of a cinema in the UK Midlands. And it doesn't stop me from going to see Opera North when they're in town, albeit for considerably more money. If I lived in or near London, I'm sure I'd choose a duff seat at CG or the Coli over a well-upholstered one at a cinema, but that isn't a choice that's open to me. Final point is that if I were approaching opera as a newbie, the cinema experience offers a fantastic low-risk way to discover the art. The quality of direction ensures that you get a really great close-up view - of real singers, quite obviously singing live - with terrific sound and illuminating commentary and features etc. And all this comes in an environment free of the tiresome cultural, social, behavioural trappings of the opera house, such that the novice can relax and enjoy themselves without fear of making some ridiculous faux pas like clapping in the wrong place or saying something that marks them out as an imposter. Nope, I think it's a Good Thing. If cinemas are booming while the theatres lose audience, perhaps theatres could match cinema tickets prices, so at least locals aren't going to a relay instead of the live performance. For many years I was a constant opera goer visiting opera house in many countries and agree that there is nothing like sitting in the auditorium of an opera house watching a live performance, however this is not possible for me now and I have therefore become a devotee of the live cinema transmissions. Without these I would miss so many fantastic productions which would be a great shame. I would advocate more productions being screened live if that were possible. One other point although, as has been said, audiences are older, in my cinema I have noticed an increasing number of younger people attending not just the opera but ballet as well. One further thought. The facility to enjoy opera or ballet (if you cannot make London) is super but I hope that we don't create a pricing structure that discourages people who can from actually attending in the house. I'm pretty sure we don't want half empty opera houses with the cinemas full. I have seen only one of these screenings so far, "Cav and Pag" and really enjoyed it. I live nowhere near the ROH and could not really afford to attend anyway. The screenings makes opera and drama from the RSC etc accessible. Somehow I get the impression that many of those who can access the ROH and screening of opera seem to feel that anything less than the whole experience is not worth attending. Opera generally appears to be elitist because of the costs and maybe the perceived attitudes about the "likes of me", feeling like a fish out of water surrounded by "posh" seasoned and erudite opera goers. This could change with these screenings. I hope the more seasoned opera goers would not feel their elite territory has been invaded. I've seen live opera and cinema opera and, while I'd prefer it live, there's no way I could get to London often enough, or afford to go as often as I'd like. Locally it means 100+ mile round trips just to Bristol or Cardiff. Cinema opera does lack some of the immediacy of atmosphere you get in live performance, but the opportunity to see e.g. Bryn Terfel in Boris Godunov, or Diana Damrau in Lucia di Lammermoor is not to be missed. I particularly have noticed the way that the [sadly frequently small] audience takes part in e.g. clapping at every opportunity even though there's no one to hear them. The great advantage of cinema is the close-ups on the performers and being drawn to specific details that one might otherwise miss. I only wish my local cinema was able to show every event. For someone not sure whether they're going to like the genre a visit to the cinema is a wonderful introduction that isn't going to cost them a large amount to 'test the water'. I don't think there's any real chance of cinema taking away visitors to live events but out here in the sticks it's a godsend and a real opportunity to draw in new people. As I live in Hexham, Northumberland, live relays are a wonderful way to experience world class operas. It may not be exactly the same as physically being in the opera house but is an excellent second best and has brought a great deal of pleasure to local people. At 80+, getting to London, or even Newcastle, is almost impossible, therefore to be able to walk to the cinema and see these performances is perfect. How I agree, I know the atmosphere of being in the opera house is not there but to have close ups and the on screen talks between acts is great. Shame Nabucco is not being relayed.